Although developed-country TNCs account for the bulk of global FDI, an examination of different data sources shows a growing and significant international presence of firms – both private and State-owned – from developing and transition economies. Their outward expansion through FDI provides development opportunities for the home economies concerned. However, it is eliciting mixed reactions from recipient countries in different parts of the world. Some welcome the increased FDI from these economies as a new source of capital and knowledge; for others it also represents new competition. A small number of source economies are responsible for a large share of these FDI outflows, but companies from more and more countries see the need to explore investment opportunities abroad to defend or build a competitive position. 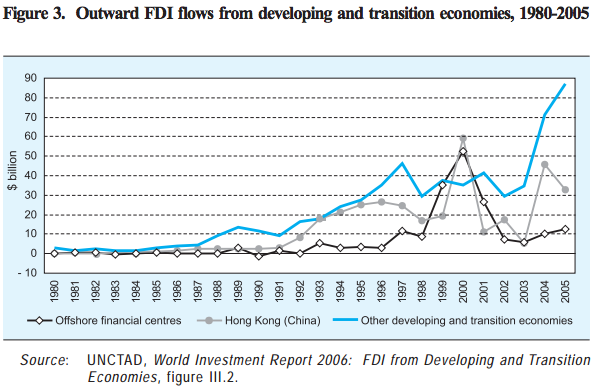 FDI from developing and transition economies reached $133 billion in 2005, representing about 17% of world outward flows. Excluding FDI from offshore financial centres, the total outflow was $120 billion – the highest level ever recorded (figure 3). The value of the stock of FDI from developing and transition economies was estimated at $1.4 trillion in 2005, or 13% of the world total. As recently as 1990, only six developing and transition economies reported outward FDI stocks of more than $5 billion; by 2005, that threshold had been exceeded by 25 developing and transition economies. Data on cross-border M&As, greenfield investments and expansion projects as well as statistics related to the number of parent companies based outside the developed world confirm the growing significance of TNCs from developing and transition economies. Between 1987 and 2005, their share of global cross-border M&As rose from 4% to 13% in value terms, and from 5% to 17% in terms of the number of deals concluded. Their share of all recorded greenfield and expansion projects exceeded 15% in 2005, and the total number of parent companies in Brazil, China, Hong Kong (China), India and the Republic of Korea has multiplied, from less than 3,000 to more than 13,000 over the past decade. Sectorally, the bulk of FDI from developing and transition economies has been in tertiary activities, notably in business, financial and traderelated services. However, significant FDI has also been reported in manufacturing (e.g. electronics) and, more recently, in the primary sector (oil exploration and mining). Data on cross-border M&As confirm the dominance of services, which constituted 63%, by value, of M&As undertaken by companies based in developing and transition economies in 2005. By industry, the highest shares that year were recorded for transport, storage and communications, mining, financial services, and food and beverages. The geographical composition of FDI from developing and transition economies has changed over time, the most notable long-term development being the steady growth of developing Asia as a source of FDI. Its share in the total stock of FDI from developing and transition economies stood at 23% in 1980, rising to 46% by 1990 and to 62% in 2005. Conversely, the share of Latin America and the Caribbean in outward FDI fell from 67% in 1980 to 25% in 2005. The top five home economies accounted for two thirds of the stock of FDI from developing and transition economies, and the top 10 for 83%. 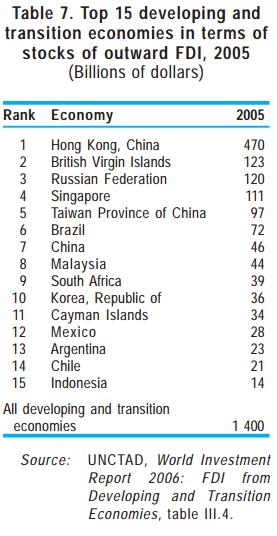 In 2005, the largest outward FDI stock among developing and transition economies was in Hong Kong (China), the British Virgin Islands, the Russian Federation, Singapore and Taiwan Province of China (table 7). A sizeable share of FDI originates from offshore financial centres. The British Virgin Islands is by far the largest such source, with an outward FDI stock in 2005 estimated at almost $123 billion. From a statistical point of view, trans-shipping FDI via offshore financial centres makes it difficult to estimate the real size of outward FDI from specific economies and by specific companies. In some years, flows from these centres have been particularly large. However, since 2000, their outward FDI has declined considerably and now amounts to around one tenth of the total flows of FDI from developing and transition economies. According to UNCTAD’s Outward FDI Performance Index, which compares an economy’s share of world outward FDI against its share of world GDP, FDI from Hong Kong (China) was 10 times larger than would be expected, given its share of world GDP. Other developing economies with comparatively high outflows included Bahrain, Malaysia, Panama, Singapore and Taiwan Province of China. Meanwhile, many countries with relatively large outward FDI in absolute terms, such as Brazil, China, India and Mexico, are at the opposite end of the spectrum, suggesting considerable potential for future expansion of FDI. …generating considerable South-South investment flows. The emergence of these new sources of FDI may be of particular relevance to low-income host countries. TNCs from developing and transition economies have become important investors in many LDCs. Developing countries with the highest dependence on FDI from developing and transition economies include China, Kyrgyzstan, Paraguay and Thailand, and LDCs such as Bangladesh, Ethiopia, the Lao People’s Democratic Republic, Myanmar and the United Republic of Tanzania. Indeed, FDI from developing countries accounts for well over 40% of the total inward FDI of a number of LDCs. For example, in Africa, South Africa is a particularly important source of FDI; it accounts for more than 50% of all FDI inflows into Botswana, the Democratic Republic of the Congo, Lesotho, Malawi and Swaziland. Moreover, the level of FDI from developing and transition economies to many LDCs may well be understated in official FDI data, as a significant proportion of such investment goes to their informal sector, which is not included in government statistics. UNCTAD estimates show that South-South FDI has expanded particularly fast over the past 15 years. Total outflows from developing and transition economies (excluding offshore financial centres) increased from about $4 billion in 1985 to $61 billion in 2004; most of these were destined for other developing or transition economies. In fact, FDI among these economies increased from $2 billion in 1985 to $60 billion in 2004. As FDI of transition economies account for a very small proportion of these transactions, this estimate can also be used as a proxy for the size of SouthSouth FDI. 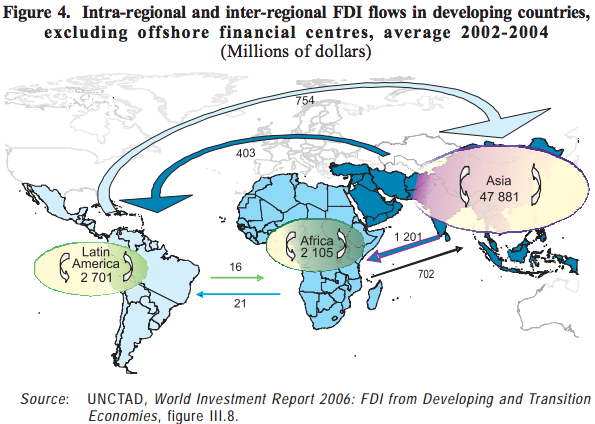 The bulk of South-South FDI (excluding offshore financial centres) is intraregional in nature (figure 4). In fact, during the period 2002-2004, average annual intra-Asian flows amounted to an estimated $48 billion. The next largest stream of FDI within the group of developing countries was within Latin America, mainly driven by investors in Argentina, Brazil and Mexico. Intraregional flows within Africa were an estimated $2 billion reflecting, in particular, South African FDI to the rest of the continent. Interregional South-South FDI has gone primarily from Asia to Africa, while the second largest has been from Latin America to Asia. Perhaps somewhat surprisingly, total flows from Asia to the Latin American region were modest during the period 2002-2004,2 and those between Latin America and Africa were negligible. The diversity of the home economies now emerging as significant sources of FDI precludes any far-reaching generalizations of the characteristics of TNCs from developing and transition economies, but it is possible to identify certain salient features. Although most of their TNCs are relatively small, a number of large ones with global ambitions have also appeared on the scene. They tend to be involved in particular industries, with notable variations between different home economies and regions. Compared with their developed-country counterparts, a relatively high degree of State ownership can be observed among the largest TNCs from developing and transition economies. However, these stylized observations should be interpreted with care, as there are important differences between regions and countries, as well as between individual companies. Although more economies are emerging as FDI sources, there is still a relatively high concentration of countries from which the major TNCs originate: from South Africa in Africa, from Mexico and Brazil in Latin America, and from the Russian Federation in the CIS. There is less concentration in Asia, where the four newly industrializing economies, along with China, India, Malaysia and Thailand, are home countries for a growing number of companies that have expanded abroad. At the same time, a number of smaller TNCs from a wider range of developing countries are also increasing their foreign activities, mostly at the regional level. There are also an increasing number of large TNCs from developing and transition economies that feature in lists of the largest companies in the world. For example, around 1990, there were only 19 companies from developing and transition economies listed in the Fortune 500; by 2005, the number had risen to 47. In terms of industrial distribution a few industries are better represented than others, but with important regional variations. Some TNCs from developing and transition economies have risen to leading global positions in industries such as automotives, chemicals, electronics, petroleum refining and steel, and in services such as banking, shipping, information technology (IT) services and construction. In some specific industries, such as container shipping and petroleum refining, developingeconomy TNCs have a particularly strong presence. In all developing regions and in the Russian Federation, major TNCs have emerged in the primary sector (oil, gas, mining) and resource-based manufacturing (metals, steel). Some of them are now competing head-on with their developed-country rivals. Examples include Sasol (South Africa) in Africa; CVRD (Brazil), ENAP (Chile), Petrobras (Brazil) and Petroleos de Venezuela (Venezuela) in Latin America; Baosteel, CNPC and CNOOC (China), Petronas (Malaysia), Posco (Republic of Korea) and PTTEP (Thailand) in Asia; and Gazprom and Lukoil (Russian Federation). Another cluster of activities involving many developing-economy TNCs are financial services, infrastructure services (electricity, telecommunications and transportation) and goods that are relatively difficult to export (cement, food and beverages). Because of their non-tradable nature, these economic activities typically require FDI if a company wishes to serve a foreign market. With a few exceptions (such as Cemex and the former South African companies, Old Mutual and SABMiller), however, most of the developing-country TNCs in these areas are mainly regional players, with limited (if any) activities in other parts of the world. A third cluster of activities consists of those that are the most exposed to global competition, such as automotives, electronics (including semiconductors and telecommunications equipment), garments and IT services. Almost all the major TNCs from developing or transition economies in these industries are based in Asia. Electronics companies such as Acer (Taiwan Province of China), Huawei (China) and Samsung Electronics (Republic of Korea), the automobile firms, Hyundai Motor and Kia Motor (Republic of Korea), or smaller TNCs in the IT services industry, such as Infosys or Wipro Technologies (India), are already among the leaders in their respective industries. In all regions studied, intraregional FDI plays a key role in TNCcontrolled international networks. This is especially true in Latin America and the CIS, but also to a large extent in Africa and Asia. The subregion of East and South-East Asia has the largest number of TNCs with global aspirations. Of the top 100 developing-country TNCs in 2004, as many as 77 were based in this subregion. Five of them are also among the top 100 global TNCs: Hutchison Whampoa (Hong Kong, China), Petronas (Malaysia), Singtel (Singapore), Samsung Electronics (Republic of Korea) and CITIC Group (China). …as developing-country TNCs respond to the threats and opportunities arising from globalization with their own distinctive competitive advantages. The increase in the number and diversity of developing-country TNCs over the past decade is largely due to the continuing impact of globalization on developing countries and their economies. The dynamics are complex, but within them the combination of competition and opportunity – interwoven with liberalization policies across developing and developed regions – is particularly important. As developing economies become more open to international competition, their firms are increasingly forced to compete with TNCs from other countries, both domestically and in foreign markets, and FDI can be an important component of their strategies. This competition, in turn can impel them to improve their operations and it encourages the development of firm-specific competitive advantages, resulting in enhanced capabilities to compete in foreign markets. Firms may respond directly to international competition or opportunities by utilizing their existing competitive advantages to establish affiliates abroad. This type of TNC strategy is referred to as “asset exploiting”. Firms can also opt for an “asset augmenting” strategy in order to improve their competitiveness by exploiting their limited competitive advantages to acquire created assets such as technology, brands, distribution networks, R&D expertise and facilities, and managerial competences that may not be available in the home economy. They may even combine both strategies. While developed-country TNCs are most likely to utilize firm-specific advantages based on ownership of assets, such as technologies, brands and other intellectual property, evidence shows that developing-country TNCs rely more on other firm-specific advantages, derived from production process capabilities, networks and relationships, and organizational structure. There are, however, significant variations by country, sector and industry. For example, TNCs in the secondary sector as a whole are most likely to possess and utilize advantages in both production process capabilities and ownership of assets (in that order), with less reliance on advantages grounded in networks and relationships, and organizations. In contrast, for TNCs in the primary sector, production process advantages are preponderant, while in the tertiary sector, networks and relationships represent the main advantage. There is some tendency to convergence with developed-country TNCs, mostly as economies become more developed (e.g. the advantages of TNCs from the Republic of Korea lie increasingly in their ownership of key technologies), but for the present a large diversity of advantages underlies the internationalization of developing-country TNCs. Many of these TNCs also enjoy non-firm-specific competitive advantages: for example, those deriving from access to natural resources or reservoirs of knowledge and expertise in their home countries. These locational advantages might be available to all firms based in an economy, but a number of developing-country TNCs are adept at combining various sources of advantage (including firm-specific ones) into a strong competitive edge. Many of the developing and transition economies that are home to large TNCs and are investing significant amounts of FDI overseas – such as Brazil, China, India, the Russian Federation, South Africa and Turkey – are doing so much earlier (and to a greater degree) than would be expected on the basis of theory or past experience. This intensification of FDI by these countries can be traced to around the early 1990s. The likely reason for this shift lies in the impact of globalization on countries and companies, especially through increased international competition and opportunities. Four key types of push and pull factors, and two associated developments help explain the drive for internationalization by developingcountry TNCs. First, market-related factors appear to be strong forces that push developing-country TNCs out of their home countries or pull them into host countries. In the case of Indian TNCs, the need to pursue customers for niche products – for example, in IT services – and the lack of international linkages are key drivers of internationalization. Chinese TNCs, like their Latin American counterparts, are particularly concerned about bypassing trade barriers. Overdependence on the home market is also an issue for TNCs, and there are many examples of developing-country firms expanding into other countries in order to reduce this type of risk. Secondly, rising costs of production in the home economy – especially labour costs – are a particular concern for TNCs from East and South-East Asian countries such as Malaysia, the Republic of Korea and Singapore, as well as Mauritius (which has labour-intensive, exportorientated industries, such as garments). Crises or constraints in the home economy, for example where they lead to inflationary pressures, were important drivers in countries such as Chile and Turkey during the 1990s. However, interestingly, costs are less of an issue for China and India – two growing sources of FDI from the developing world. Clearly, this is because both are very large countries with considerable reserves of labour, both skilled and unskilled. Thirdly, competitive pressures on developing-country firms are pushing them to expand overseas. These pressures include competition from low-cost producers, particularly from efficient East and South-East Asian manufacturers. Indian TNCs, for the present, are relatively immune to this pressure, perhaps because of their higher specialization in services and the availability of abundant low-cost labour. For them, competition from foreign and domestic companies based in the home economy is a more important impetus to internationalize. Similarly, competition from foreign TNCs in China’s domestic economy is widely regarded as a major push factor behind the rapid expansion of FDI by Chinese TNCs. Such competition can also sometimes result in pre-emptive internationalization, as when Embraer (Brazil) and Techint (Argentina) invested abroad in the 1990s, ahead of liberalization in their respective home industries. Domestic and global competition is an important issue for developing-country TNCs, especially when these TNCs are increasingly parts of global production networks in industries such as automobiles, electronics and garments. Fourthly, home and host government policies influence outward FDI decisions. Chinese TNCs regard their Government’s policies as an important push factor in their internationalization. Indian firms, on the other hand, have been enticed by supportive host-government regulations and incentives, as well as favourable competition and inward FDI policies. South African TNCs, among others, mention transparent governance, investment in infrastructure, strong currencies, established property rights and minimal exchange-rate regulations as important pull factors. Most importantly, liberalization policies in host economies are creating many investment opportunities, for example through privatizations of State-owned assets and enterprises. Apart from the above mentioned factors, there are two other major developments driving developing-country TNCs abroad. First, the rapid growth of many large developing countries – foremost among these being China and India – is causing them concern about running short of key resources and inputs for their economic expansion. This is reflected in strategic and political motives underlying FDI by some of their TNCs, especially in natural resources. Second, there has been an attitudinal or behavioural change among the TNCs discussed in this chapter. They increasingly realize that they are operating in a global economy, not a domestic one, which has forced them to adopt an international vision. These two developments, along with push and pull factors – especially the threat of global competition in the home economy and increased overseas opportunities arising from liberalization – adds empirical weight to the idea that there is a structural shift towards earlier and greater FDI by developingcountry TNCs. …which, together with TNCs’ motives and competitive advantages, result in most of their FDI being located in developing countries. In principle, four main motives influence investment decisions by TNCs: market-seeking, efficiency-seeking, resource-seeking (all of which are asset exploiting strategies) and created-asset-seeking (an assetaugmenting strategy). Surveys undertaken by UNCTAD and partner organizations on outward investing firms from developing countries confirm that, of these motives, the most important one for developing-country TNCs is market-seeking FDI, which primarily results in intraregional and intra-developingcountry FDI. Within this, there are differences in patterns of FDI, depending on the activity of the TNC: for example, FDI in consumer goods and services tends to be regional and South-South orientated; that in electronic components is usually regionally focused (because of the location of companies to which they supply their output); in IT services it is often regional and orientated towards developed countries (where key customers are located); and FDI by oil and gas TNCs targets regional markets as well as some developed countries (which remain the largest markets for energy). Efficiency-seeking FDI is the second most important motive, and is conducted primarily by TNCs from the relatively more advanced developing countries (hence higher labour costs); it tends to be concentrated in a few industries (such as electrical and electronics and garments and textiles). Most FDI based on this motive targets developing countries; that in the electrical/electronics industry is strongly regionally focused, while FDI in the garments industry is geographically more widely dispersed. Generally, resource-seeking and created-asset-seeking motives for FDI are relatively less important for developing-country TNCs. Not unexpectedly, most resource-seeking FDI is in developing countries and much created-assetseeking FDI is in developed countries. Apart from the above motives, a common one for TNCs from some countries is that of strategic objectives assigned to State-owned TNCs by their home governments. Some governments have encouraged TNCs to secure vital inputs, such as raw materials for the home economy. For example, both Chinese and Indian TNCs are investing in resource-rich countries, especially in oil and gas (to expand supplies, in contrast to targeting customers as does market-seeking FDI in this industry). In the case of Chinese TNCs, the quest for secure supplies of a wide range of raw materials is complemented by parallel and sustained Chinese diplomatic efforts in Africa, Central Asia, Latin America and the Caribbean, and West Asia. In terms of location of FDI, the net result of the relevant drivers, advantages and motives is that most investments are in other developing countries (e.g. because of similarities in consumer markets, technological prowess or institutions) or within their region (i.e. neighbouring countries with which they are familiar). TNCs from developing countries and transition economies are here to stay. As they expand overseas, they gain knowledge, which potentially benefits them in two ways. First, they learn from experience and improve their ability to operate internationally. Second, they gain expertise and technology to enhance their firm-specific advantages, thereby improving their competitiveness and performance. This improved competitiveness has implications for home countries. By the same token, developing-country TNCs can have an impact on host developing economies in a number of ways, ranging from financial resource flows and investment to technology and skills. The most important potential gain for a firm from outward FDI is increased competitiveness, that is, the ability to survive and grow in an open economy, and attain its ultimate objectives of maximizing profits and retaining or increasing market share. Outward FDI can be a direct path to market expansion. In certain circumstances, it is the only path, for example when there are trade barriers that inhibit exports or when the TNC is in the business of providing a service that is non-tradable. Many developingcountry TNCs have indeed expanded their markets through outward FDI, either through M&As or through greenfield investments. Outward FDI can also contribute to a company’s competitiveness by increasing its efficiency. Rising domestic costs, especially labour costs, have led a number of East and South-East Asian TNCs to invest in less expensive locations, with significant efficiency gains. In the above-mentioned surveys of outward investing firms from developing countries conducted by UNCTAD and partner organizations, market expansion in a broad sense (including market diversification) was the benefit most frequently mentioned, followed by efficiency gains. Case studies confirm that outward FDI has indeed enabled developing-country firms to enter new markets and expand their businesses. In a range of industries, such as white goods and personal computers, a number of Asian TNCs, such as Acer (Taiwan Province of China), Arcelik (Turkey), Haier (China) and Lenovo (China), have successfully expanded their markets through FDI, which has helped them grow into global players. Some companies from other developing regions have also ventured beyond their borders and become successful players in regional and even global markets. For instance, in 2005, Cemex (Mexico) became the third largest cement-making company in the world, with more than two thirds of its sales in developed countries. Enhancing enterprise competitiveness through outward FDI is a complex undertaking. It goes beyond the immediate gains arising from market expansion and/or cost-cutting, and includes upgrading technology, building brands, learning new management skills, linking up with global value chains, and moving up these chains into more advanced activities. Some of these tasks can be protracted and, in straight financial terms, bring little or no gain in the short run. This is particularly likely when the outward FDI is asset-augmenting rather than asset-exploiting, since in the former case the acquired assets must first be assimilated. Firms that invest abroad tend to be more competitive than their domestically oriented peers. However, these firms are also subject to risks inherent in projects undertaken abroad. Some of these projects may fail for various reasons, with potential negative effects on the parent company. One of the reasons is the disadvantage of being foreign, another is the existence of cultural, social and institutional differences between home and host economies, and the third is the increasing need for coordinating activities and concomitant organizational and environmental complexities. Outward FDI from developing countries can also contribute directly and indirectly, to a home economy as a whole. Arguably, the most important potential gain for home countries from outward FDI is the improved competitiveness and performance of the firms and industries involved. Such gains may translate into broader benefits and enhanced competitiveness for the home country at large, contributing to industrial transformation and upgrading of value-added activities, improved export performance, higher national income and better employment opportunities. Improved competitiveness of outward investing TNCs can be transmitted to other firms and economic agents in home countries through various channels, including via linkages with, and spillovers to, local firms, competitive effects on local business, and linkages and interactions with institutions such as universities and research centres. In sum, the more embedded the outward investing TNCs are, the greater will be the expected benefits for the home economy. Evidence suggests that under appropriate home-country conditions, improved competitiveness of outward investing firms can indeed contribute towards enhancing industrial competitiveness and restructuring in the home economy as a whole. For instance, broader upgrading has occurred in whole industries in which firms have engaged in outward FDI. Examples are the IT industry in India, the consumer electronics industry in the Republic of Korea and China, and the computer and semiconductor industries in Taiwan Province of China. At the same time, outward FDI may pose several risks for the home economy: it can lead to reduced domestic investment, hollowing out of parts of the economy and loss of jobs. As always, the beneficial impacts have to be weighed against possible damaging impacts. The benefits are usually reaped when certain preconditions are met, for example a reasonably competitive home market or the absorptive capacity to profit from advanced technology. The net outcome of the different economic and non-economic impacts for a home economy depends on the underlying motives and strategies of firms for investing overseas and on the characteristics of the home economy itself. While outward FDI entails the transfer of capital from home to host country, it can also generate inflows in the form of repatriated profits, royalties and licensing fees, and payments by the host country for increased imports from the home country (often in the form of intra-firm trade). In general, in the immediate aftermath of the outward investment, net financial flows tend to be negative but then gradually become positive. Outward FDI also seems to have a delayed but positive effect on domestic investment. The trade impacts of outward FDI on the home economy depend significantly – as in the case of developed-country FDI – on the motivations and types of investment undertaken. If the TNCs seek natural resources, outward FDI could lead to an increase in imports of those resources and exports of the inputs required for extraction. Market-seeking FDI can be expected to boost exports of intermediate products and capital goods from the home economy to the host country. If the motivation is efficiency or cost-reduction, outward FDI could enhance exports as well as imports, especially intra-firm trade, and their extent and pattern, depending on the geographic spread of the TNCs’ integrated international production activities. Results of some studies on Asian developing home economies and data on trade by affiliates of developing-country TNCs in the United States and Japan suggest a positive relationship between home-country exports and outward FDI from developing countries. Regarding employment, the impacts also vary according to the motivation of FDI. Efficiency-seeking FDI may raise many questions from a home-economy perspective. Even if it leads to a greater demand for higher skills at home, this may be of limited use to workers with low skills. Other kinds of FDI appear to have positive employment effects in the long run, depending considerably on the motivations of firms and their types of investments abroad. Evidence related to some Asian economies, such as Hong Kong (China) and Singapore, suggests that, under appropriate conditions, outward FDI can generate additional jobs in higher-skilled technical and managerial categories while reducing those in unskilled ones. On balance, in those economies, the job-creating effects of outward FDI exceeded its job-reducing effects. Much would depend, however, on the capacities of the human resources in the home country to adapt to changes in the structure of the home economy. Developing host countries may also gain from the rise in South-South FDI. For developing host economies, FDI from other developing countries provides a broader range of potential sources of capital, technology and management skills to tap. For low-income developing countries, it can be of great importance. As indicated above, in a number of LDCs, it accounts for a large share of total FDI inflows. To the extent that firms from developing countries invest appreciable amounts in other developing countries, that investment provides an important additional channel for further South-South economic cooperation. Because the motivations and competitive strengths of developingcountry TNCs and the locational advantages sought by these firms diverge in several respects from those of TNCs from developed countries, their impact on host developing economies may carry certain advantages over that of FDI from developed countries. For example, the technology and business model of developing-country TNCs are generally somewhat closer to those used by firms in host developing countries, suggesting a greater likelihood of beneficial linkages and technology absorption. Developing-country TNCs also tend to use greenfield investments more than M&As as a mode of entry. This applies especially to investment in developing host countries. In this sense, their investments are more likely to have an immediate effect in improving production capacity in developing countries. The trade impacts of FDI from developing countries also vary according to motives. Efficiency-seeking FDI is most likely to boost exports, which may include local value addition of various kinds. One recent prominent kind of efficiency-seeking FDI has been in the garments industry, which has had substantial export-boosting effects in LDCs in particular. However, local sourcing and backward linkages in this industry have been limited, with the result that the ending of MFA quotas has led to a reduction in such FDI, for instance in Lesotho. In market-seeking FDI, especially in manufacturing, the effect is mainly one of import substitution. Resourceseeking FDI, of course, is export-oriented almost by definition, and may allow the host country to diversify its markets. A major advantage for host developing countries of FDI by developing-country TNCs, as compared to that from developed-country TNCs, is the greater employment-generating potential of the former. The main reason is that developing-country TNCs may be oriented more towards labour-intensive industries, and may be more inclined to use simpler and more labour-intensive technologies, especially in manufacturing. Empirical evidence on average employment per affiliate in host developing countries suggests developing-country TNCs hire more people than do developedcountry TNCs. In the case of sub-Saharan Africa, for example, it has been found that the labour intensity of developing-country TNCs tends to be higher than that of developed-country TNCs in the majority of industries covered. Foreign affiliates of developing-country TNCs, on average, created more jobs per million dollars of assets than did those of developed-country TNCs. The effects of FDI on wages are generally positive, as TNCs as a whole pay higher wages than local employers. Although data specific to developing-country TNCs are limited, indirect evidence suggests that, at least for skilled labour, they offer higher wages than host-country domestic firms. But South-South FDI – like all FDI – also carries risks that can give rise to concerns. One is that foreign TNCs might dominate the local market. Another is that some host countries might feel threatened by the presence of too many firms from a single home country. For example, the dominance of South African TNCs has triggered some unease in neighbouring host countries. There is also the issue of undue political influence when an investing enterprise is State-owned, which is the case with many developing-country TNCs in natural resources. The political and social aspects of TNCs’ activities may also give rise to controversy, partly due to the size of their operations. In developing host economies, such problems have sometimes been exacerbated by the absence of an adequate regulatory framework and disparity in the allocation of economic benefits from inward FDI. In economies where domestic industries are underdeveloped, governments may not have the capabilities to ensure that acceptable labour and environmental standards, for example, are adhered to when foreign firms introduce new production processes or working methods. In sum, outward FDI from developing countries provides a potential avenue for gains from economic cooperation among developing countries. As investment by developing-country TNCs have certain inherent characteristics, including a greater orientation towards labour-intensive industries, it is of considerable relevance to low-income countries. At the same time, outward FDI from developing countries is a relatively new phenomenon. The limited evidence presented in this Report suggests that for home as well as host developing countries, the positive effects of FDI from developing countries may outweigh the negative ones; however further research is necessary to deepen the understanding of the impact of such FDI on developing economies. The emergence of TNCs from some developing and transition economies as key regional or global players is paralleled by important changes in both developed and developing countries of policies governing FDI and related matters. The ability of countries – be they sources or recipients of such investment – to benefit from such investment activity is influenced by active policies. By providing the appropriate legal and institutional environment, home country governments can create conditions that will induce their firms to invest overseas in ways that will produce gains for the home economy. From a home-country perspective, more and more developing and transition economies are dismantling previous barriers to outward FDI. While some form of capital control is often still in place to mitigate the risk of capital flight or financial instability, restrictions are mostly aimed at limiting other international capital flows than FDI. Only a handful of developing countries retain outright bans on outward FDI. Countries are increasingly recognizing the potential benefits from outward FDI. A number of governments, especially in developing Asia, are even actively encouraging their firms to invest abroad using a variety of supportive measures to that end. Such measures include information provision, match-making services, financial or fiscal incentives, as well as insurance coverage for overseas investment. There is no one-size-fits-all policy that can be recommended to deal with outward FDI. Every home country has to adopt and implement policies that fit its specific situation. Whether a country will benefit by moving from “passive liberalization” to “active promotion” of outward FDI depends on many factors, including the capabilities of its enterprise sector, and the links of the investing companies with the rest of the economy. Certain local capabilities are needed to exploit successfully the improved access to foreign markets, resources and strategic assets that outward FDI can bring about. Moreover, a certain level of absorptive capacity in the domestic enterprise sector may also be required to generate broader benefits from outward FDI. In many low-income countries, it may therefore be appropriate to focus on creating a more attractive business environment and enhancing domestic firm capabilities. Still, for those countries that decide to encourage their firms to invest abroad, it is advisable to situate policies dealing specifically with outward FDI within a broader policy framework aimed at promoting competitiveness. The importance of generating domestic capabilities to benefit from outward FDI makes it appropriate to connect outward FDI-specific policies to those applied in areas such as development of small and medium-sized enterprises, technology and innovation. Moreover, outward FDI is only one of several ways in which a country and its firms can connect with the global production system. Government efforts to promote outward FDI can therefore benefit from close coordination with those related to attracting inward FDI, promoting imports or exports, migration and technology flows. The most elaborate use of measures to promote outward FDI is found in South, East and South-East Asia. In several countries of this region, governments discharge their promotional policies via trade promotion organizations, investment promotion agencies (IPAs), export credit agencies and/or EXIM banks. A range of policy instruments is applied in innovative ways, often targeting specific types of outward FDI. Some governments in Africa and Latin America have also publicly stressed the importance of outward FDI, but these statements have rarely been followed by concrete promotional measures. Particular attention is warranted to the role of outward FDI in the context of “South-South” cooperation. Governments in Asia and Africa have outlined specific programmes to facilitate such investment. Some of these programmes are aimed at strengthening intra-regional development (as in the case of infrastructure-related FDI by South African State-owned enterprises), while others are inter-regional in scope. This is an area that needs to be further explored and supported through closer collaboration among developing-country institutions. An interesting recent UNCTAD initiative to this end is the establishment of the G-NEXID network, which will allow for the sharing of experiences among EXIM banks from developing countries. There are also policy implications for host countries. A key question is what developing host countries can do to leverage fully the expansion of FDI from the South. In terms of enhancing the positive impact of such FDI, they need to consider the full range of policies that can influence the behaviour of foreign affiliates, and their interaction with the local business environment. This requires taking into account the specific characteristics of different industries and activities in designing a strategy to attract desired kinds of FDI. In addition, it is important to promote the amount and quality of linkages between foreign affiliates and domestic firms. Host-country governments can use various measures to encourage linkages between domestic suppliers and foreign affiliates and strengthen the likelihood of spillovers in the areas of information, technology and training. In terms of addressing potential concerns and negative effects associated with inward FDI, there is no principal difference between the policies to apply in the case of FDI from developed countries and in the case of FDI from developing and transition economies. The scope for “South-South” FDI has led many developing host countries to adopt specific strategies to attract such investment. In a 2006 UNCTAD survey of IPAs, more than 90% of all African respondents stated that they currently targeted FDI from other developing countries, notably from within their own region. Indeed, for African IPAs, South Africa tops the list of developing home countries targeted, while in Latin America and the Caribbean, Brazil is the most targeted country. Meanwhile, developedcountry IPAs also court investors from developing and transition economies. A significant number of such agencies have already set up local offices for that purpose in places like Brazil, China, India, the Republic of Korea, Singapore and South Africa. This expanded diversity of potential sources of FDI may imply greater bargaining power of recipient countries to the extent that they are able to attract a greater number of investors to compete for existing investment opportunities. Notwithstanding the interest in FDI from developing and transition economies, some stakeholders are less enthusiastic about some of the new investors. Several cross-border M&As by TNCs with links to their respective governments have generated national-security concerns, and others have spurred fears of job cuts. Countries in which State-owned TNCs embark on internationalization through FDI need to be aware of the potential sensitivities involved. In some host countries, State ownership is seen as an increased risk of a transaction being undertaken for other than purely economic motives. This is especially the case if the acquisitions relate to energy, infrastructure services or other industries with a “security dimension”. Whether private or State-owned, investors from developing or transition economies that are anxious to tap the markets and resources of developed countries may also face growing pressure to address more fully issues related to corporate governance and transparency. As far as the recipient countries are concerned, business leaders, trade unions as well as policymakers may have to get used to an increased frequency of transactions involving companies from developing and transition economies as acquirers of domestic firms. There may be important benefits to a host country from having more companies competing to acquire local assets. Countries need to be careful in their use of legislation aimed at protecting national security interests, keeping in mind the risk of fuelling possible retaliation and protectionism. Issues of corporate social responsibility (CSR) may also become more important as developing-country firms expand abroad. Discussions related to CSR have traditionally revolved around developed-country TNCs and their behaviour abroad; more recently the managements of TNCs from developing and transition economies are also being exposed to similar issues. While adherence to various internationally adopted CSR standards may entail costs for the companies concerned, it can also generate important advantages – not only for the host country, but also for the investing firms and their home economies. A number of developing-country TNCs have already incorporated CSR policies into their business strategies, some of them even becoming leaders in this area. For example, more than half of the participating companies in the United Nations Global Compact are based in developing countries. Moreover, some developing countries are establishing a regulatory and cultural environment that supports CSR standards. These initiatives are sometimes driven by governments and at other times by business associations, non-governmental organizations or international organizations. …and for international rule making. Beyond the national level of policy-making, there is a marked increased in South-South investment cooperation through IIAs, in parallel to the growth of FDI from the South. The increase of FDI from some of these economies is also likely to generate growing demand from their business community for greater protection of their overseas investments. As a consequence, in addition to using IIAs as a means to promote inward FDI, some developing-country governments will increasingly consider using IIAs to protect and facilitate outward investments. This may influence the content of future treaties and result in an additional challenge for those developing country governments to balance their need for regulatory flexibility with the interests of their own TNCs investing abroad. Developing and transition economies have emerged as significant outward investors… …generating considerable South-South investment flows. New global and regional players are emerging, especially from Asia… …as developing-country TNCs respond to the threats and opportunities arising from globalization with their own distinctive competitive advantages. Their outward expansion is driven by various factors … ...which, together with TNCs’ motives and competitive advantages, result in most of their FDI being located in developing countries. Increased competitiveness is one of the prime benefits that developing-country TNCs can derive from outward FDI … …while home countries can also benefit Developing host countries may also gain from the rise in South-South FDI. The expansion of outward FDI from developing countries is paralleled by changing policies in home countries... …various policy responses in host countries … …and it has implications also for the management of CSR issues… …and for international rule making.